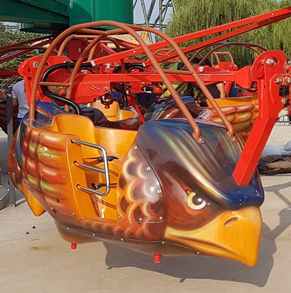 We are pleased to announce the opening of Huss Park Attractions’ Condor 2G at Sun Tzu Cultural Park in Shandong, China. The park is the first and largest military cultural theme park in China, designed to promote Sun Tzu culture and create a cultural tourism destination. It features over 30 rides, from children’s attractions to major thrill rides, among which is the HUSS® Condor 2G. 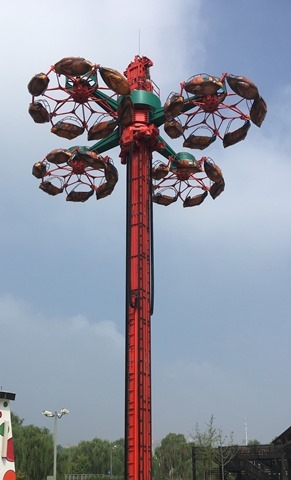 The attraction, which creates a striking landmark for parks, is part of the highly successful HUSS® Classic Rides range and features a 31m high tower on which is a lift assembly with four cantilever arms, each carrying a satellite in the form of star shaped steel frames. 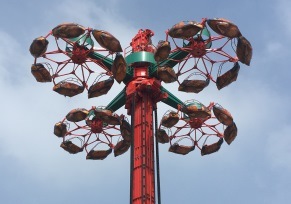 At the circumference of each gyro frame are seven double-seat, counter rotating gondolas which are suspended on a horizontal axis and are capable of a free swinging motion. The Condor 2G qualifies as the ideal family ride. It combines a family friendly and gentle flight experience with an exciting panoramic adventure, passengers being taken up to a height of 24m. The Sun Tzu Cultural Park ride features the classic condor gondola design and carries a maximum of 56 passengers. The opening of the attraction was perfectly timed with the festivities taking place to celebrate the Chinese New Year.